Ten Quick & Easy Halloween Costume Ideas! When Halloween season comes around, there are typically two types of people. The first kind spends weeks decorating the house and preparing elaborate family costumes. The second grits their teeth, hoping every time they check their email they won’t see an invite to any kind of party that requires them to come in costume. Do you happen to fall more into the second category? Fear not, this blog is for you. 3. Put on your favorite red shirt or dress. Cut out a few circles from black construction paper and tape them on. Bam, you’re a ladybug. 4. Invest in a cheap witch’s hat or cat ears headband. Pair them with anything black you have in your closet and no one can say you’re not in costume. 5. Own a flannel shirt and jeans? Buy a straw hat, use eyeliner to give yourself freckles and instantly you’re an ‘old-timey’ farmer. Pigtails add a nice touch. Those with short hair can make pigtails out of yarn and clip into hair. 6. Speaking of pigtails, wear them with anything baby pink or baby blue and carry around a teddy bear. Instant baby costume. 8. Wear the sparkliest, fanciest dress you own and create a sash out of crepe paper. Buy a dollar store tiara and instantly you’re a beauty queen. Great way to get a second wear out of last year’s New Year’s Eve outfit! 10. For men (or women!) – put on a black shirt and pants with sunglasses for an instant bouncer costume. If you want to go all out (which we know you probably don’t…), put on a dark suit with those same sunglasses and suddenly you’re CIA. Hopefully, these quick and easy costume ideas will make the season just a little less stressful. And speaking of less stress, don’t forget to keep a box of S.O.S® Soap Pads on hand to make sure Halloween clean-up is quick and easy, too. 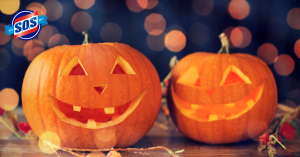 We’ll handle everything from pumpkin-shaped cookies stuck to your favorite pan, to zombie face paint running down your shower walls, to a neighborhood’s worth of dirt and leaves stuck to your plastic flip-flops after Trick or Treating! S.O.S makes tough clean-up jobs look easy. Want to see more unique ways you can use S.O.S both indoors and outdoors to clean up around your home, garage, workshop, and patio? Click here! Do you have a favorite quick and easy costume idea? Let us know in the comments below or on the S.O.S Facebook page. Don’t forget to follow us on Facebook, Twitter, Pinterest, and Instagram, too! 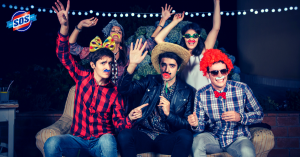 6 Responses to Ten Quick & Easy Halloween Costume Ideas! Put on a red hat, green shirt and green britches, and red socks and/or shoes. You’re an olive! Wear several layers of different patterns and colors of gray. And scarves and jewelery if you have it. If you have gray make up, put different designs on your face. Instant 50 shades of grey.. Wear a name tag that says hello my name is Mystique. Anyone can do it. Big straw hat. Plaid shirt. Old jean capris and straw glued to cloth and fastened on to ur capri leg opening and sleeves of shirt. Now u have a scarecrow. Color one eye socket completely black, put a letter “P” on the front of your shirt. You become a black-eyed P!